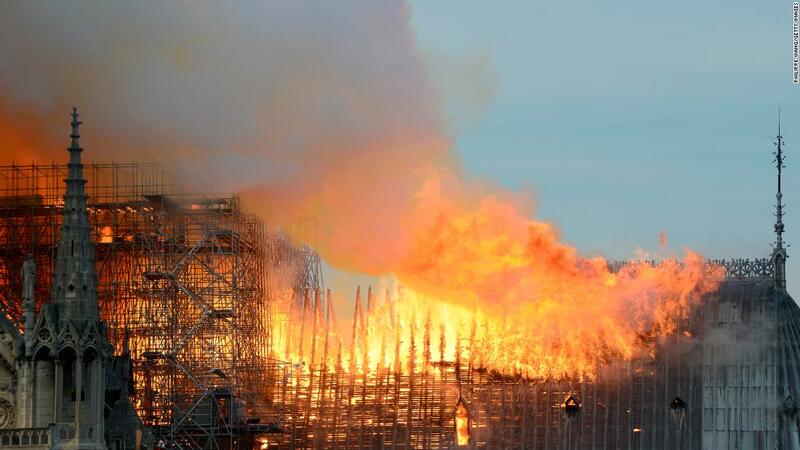 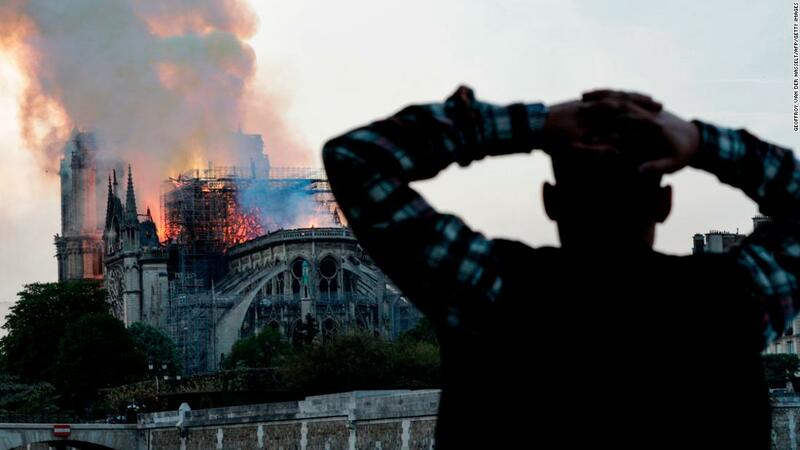 Paris (CNN)As emergency crews pick through the charred remains of Notre Dame cathedral’s ancient wooden beams, which turned the world-famous site into an inferno on Monday night, focus has turned to the investigation into how the blaze started. 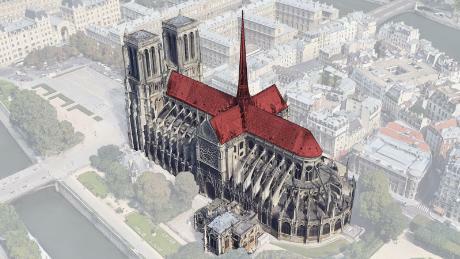 Notre Dame: Aerial animation shows the damage caused by fire 00:37Of the four companies contracted to carry out renovations at Notre Dame, only two companies, scaffolding firm Europe Echafaudage and art conservationists Socra, had work in progress there at the time of the fire. 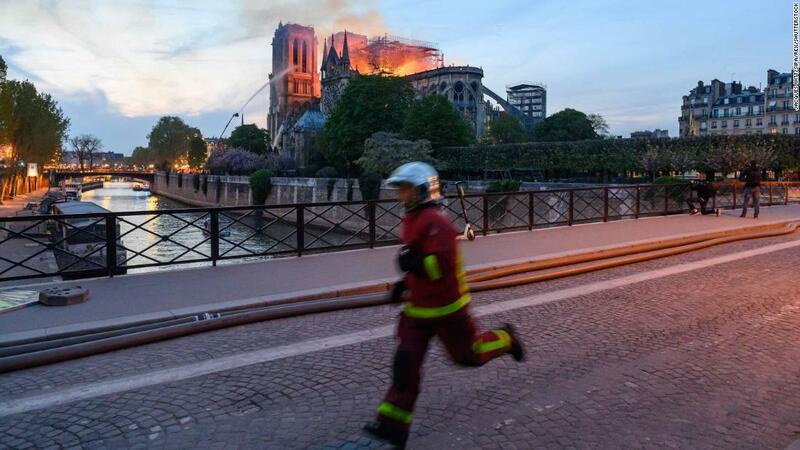 Neither company had workers on site when the fire broke out, CNN has learned.According to centraledesmarches.com, a website where private companies can bid for public projects, Europe Echafaudage and its parent company, Le Bras Freres, were awarded contracts worth 3,493,766 euros ($3,951,396) for scaffolding and other services. 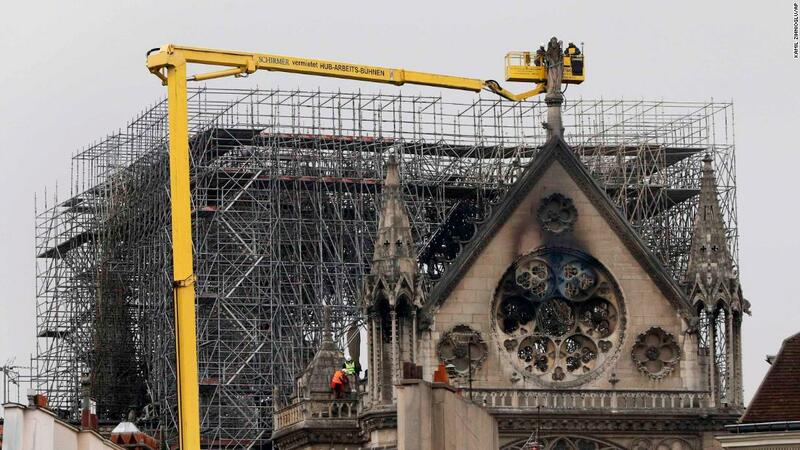 Coronations, protests and tightrope artists: A visual history of Notre DameJulien Le Bras, CEO of Europe Echafaudages, which received a contract to renovate the spire in 2017, told reporters Tuesday that 12 of his employees were working on the project, but that “there were absolutely no workers on site when the fire broke out, and there hadn’t been for quite a while before the fire.”Mark Eskenazi, a PR representative for Le Bras Freres, told CNN the company is speaking to experts about how to take down the scaffolding and “absolutely” denies responsibility for what happened, saying that its workers had left the cathedral one hour before the fire began. 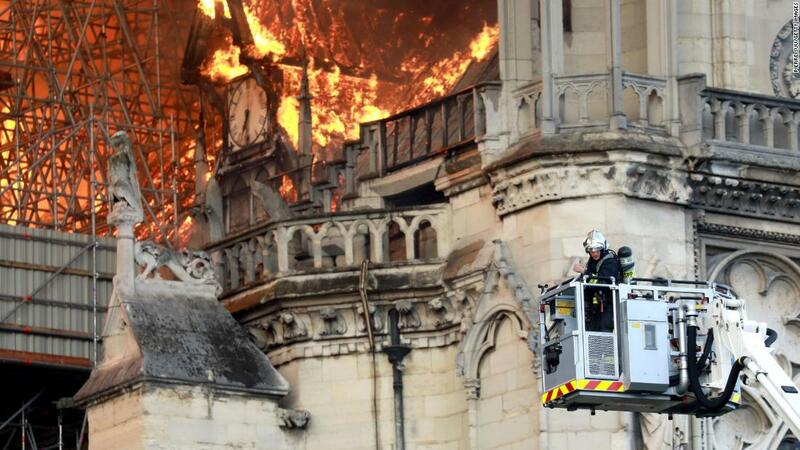 He called the fire a “crisis” for the small business of 20 workers. 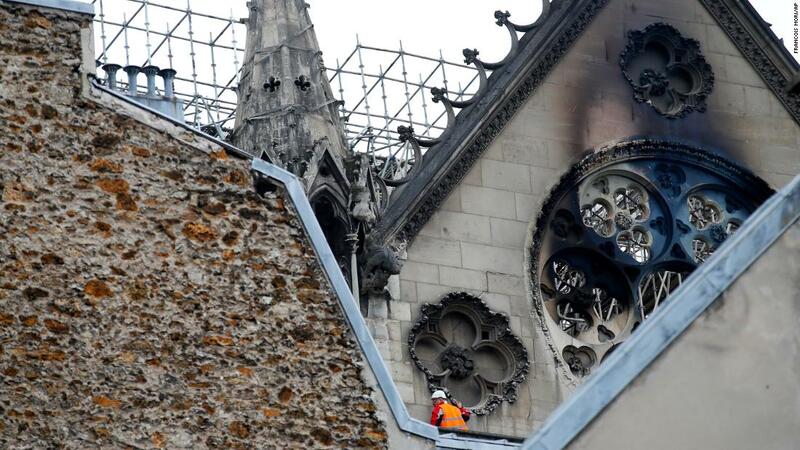 “They are artisans, it is a very small enterprise.” Patrick Palen, a spokesman for Socra, which was brought in to refurbish statuettes from the cathedral, told CNN that workers from the company removed 12 statues of the apostles and four of evangelists from the cathedral last week. 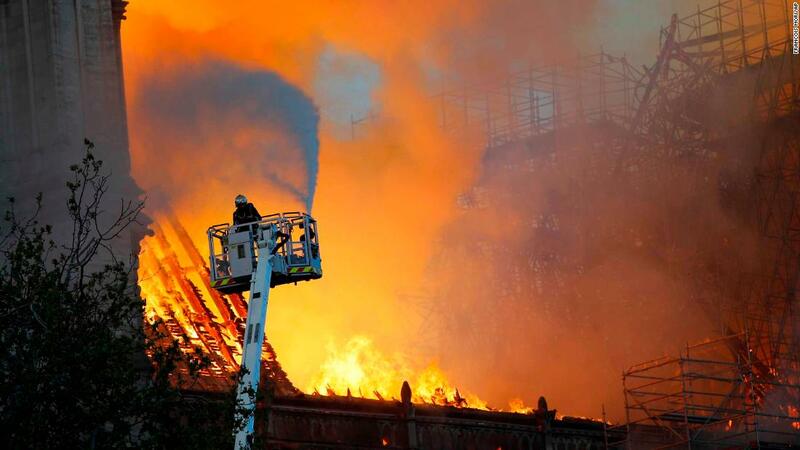 Those statues were being held safely in an off-site workshop at the time of the fire. 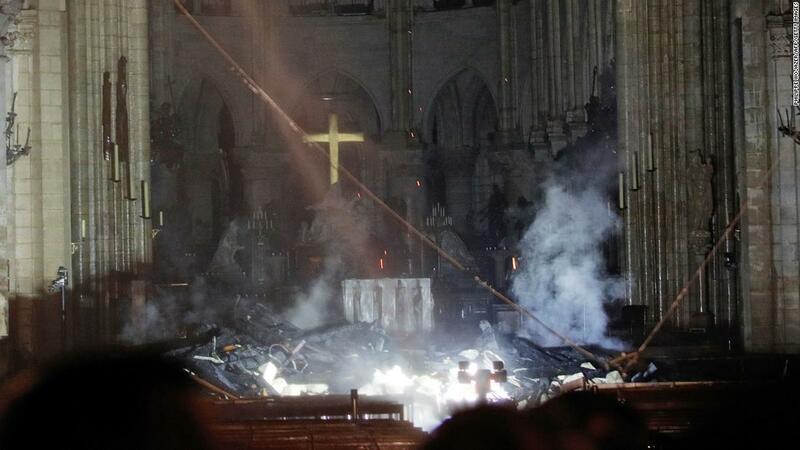 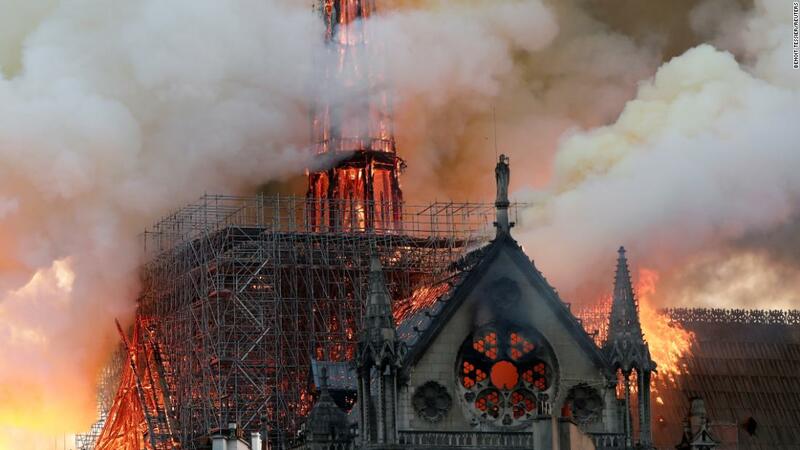 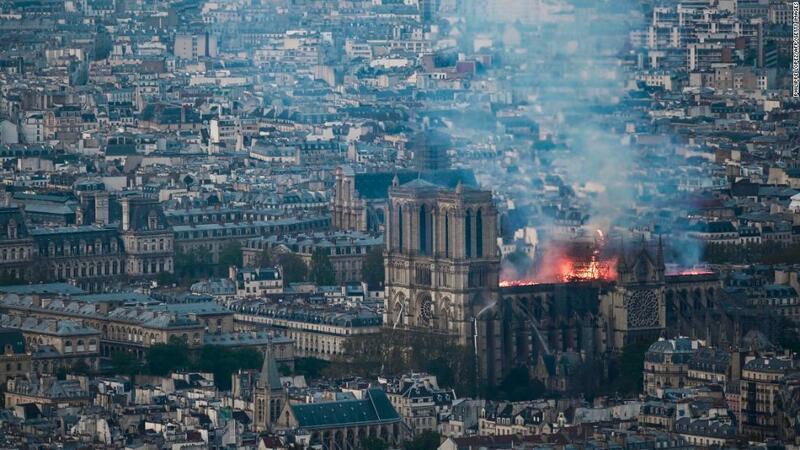 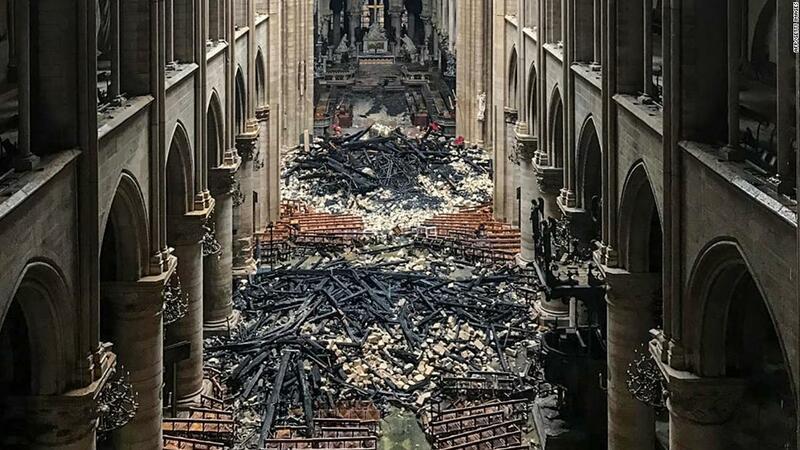 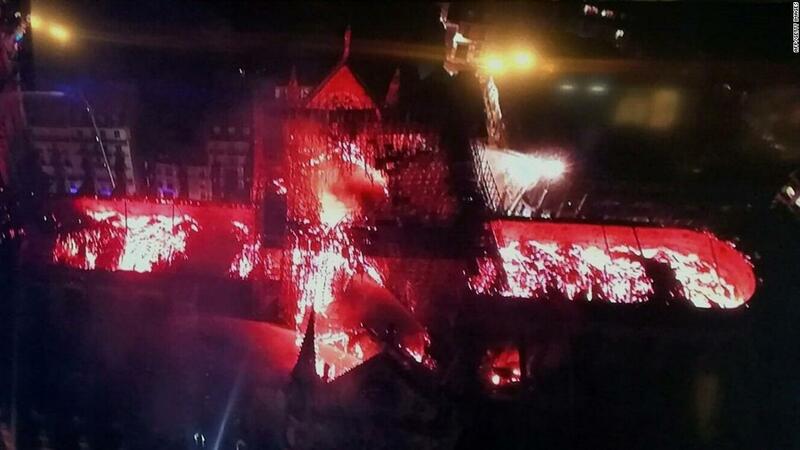 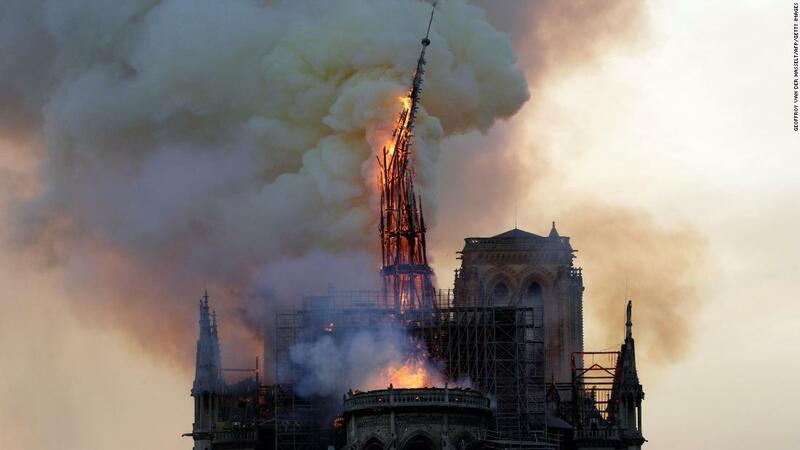 Palen said Socra employees were not at Notre Dame during the fire.The fire was extinguished early Tuesday after nine grueling hours, but not before the cathedral’s roof had fallen in. 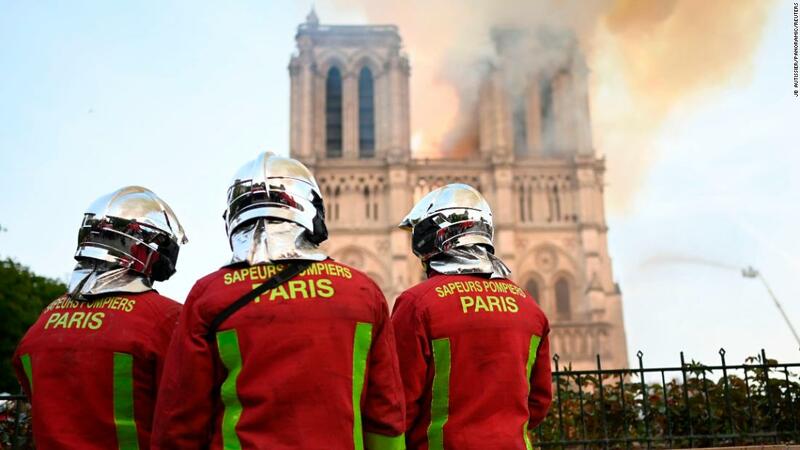 Two policemen and a firefighter — one of 400 fire personnel deployed to tackle the blaze — were injured during the operation.French Junior Interior Minister Laurent Nunez said Tuesday that experts had identified “some vulnerabilities” in the fabric of the building following the fire. 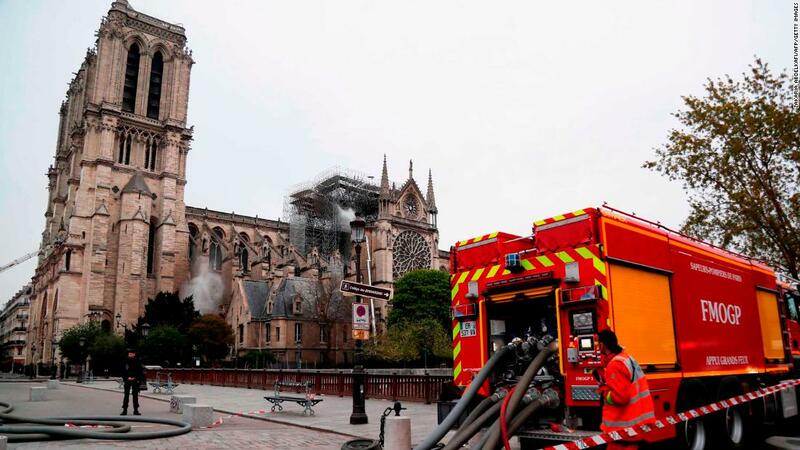 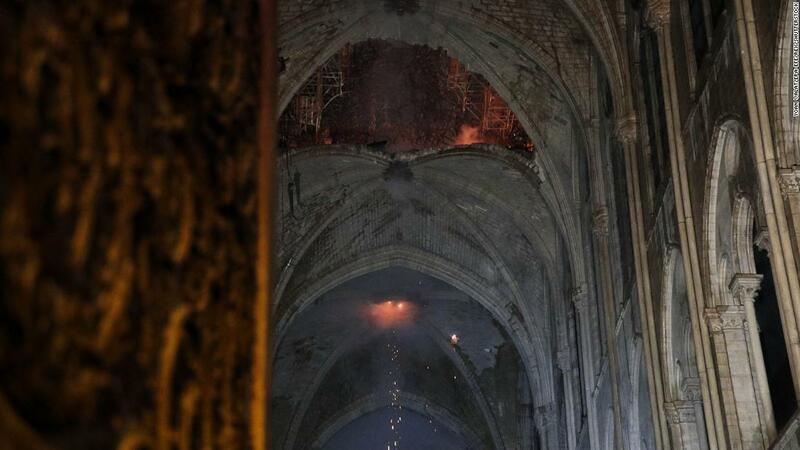 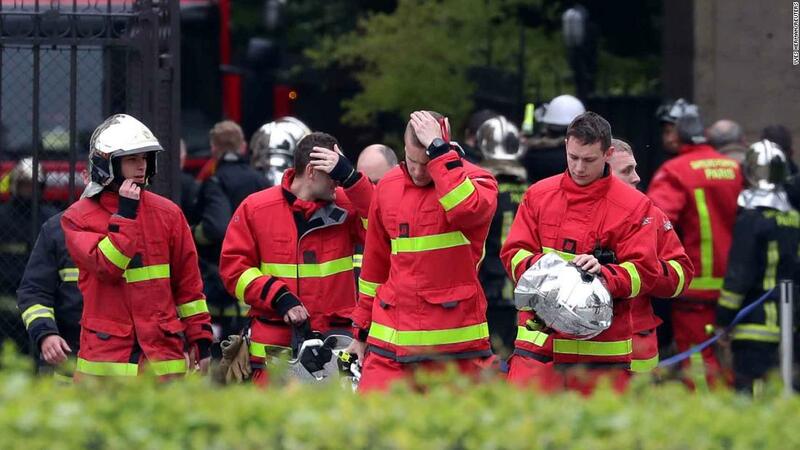 Relics and artwork rescuedSecurity guards at the 850-year-old cathedral first heard the fire alarm at 6:20 p.m. local time on Monday, and evacuated the cathedral even though they didn’t see any sign of fire, a spokesman for the Paris Fire Brigade told CNN. 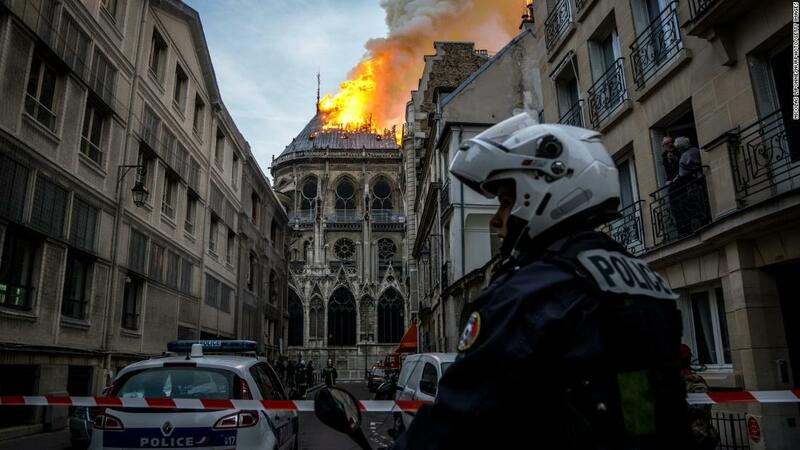 The alarm sounded again some 20 minutes later, at which point the cathedral’s security officers noticed the fire, Paris prosecutor Remy Heitz said.Despite the rapid spread and intensity of the fire, authorities announced that some of the cathedral’s major relics, artifacts and artwork had been rescued. 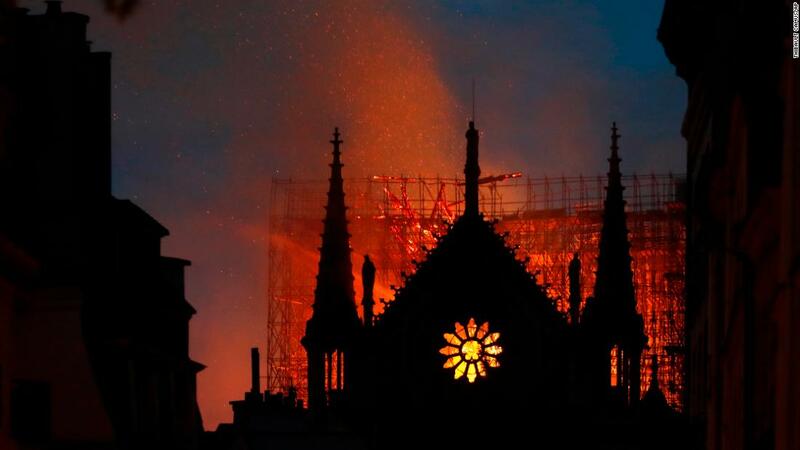 Some of the most valuable artworks are being held at City Hall, while a number of other pieces are being transferred to the Louvre museum.The Crown of Thorns, believed to be a relic of the passion of Christ, and the Tunic of Saint Louis were among the venerated artifacts saved, Paris Mayor Anne Hidalgo said. 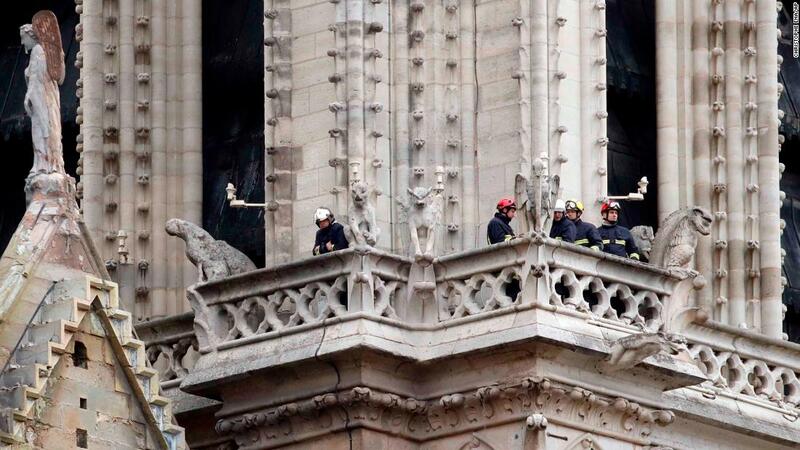 The copper rooster that sat atop the spire which collapsed in Monday’s blaze has been recovered intact, according to the French Ambassador to the United States Gerard Araud. 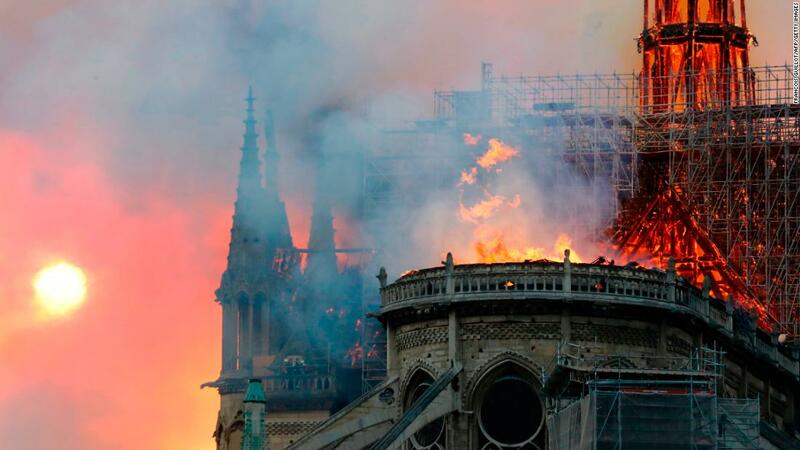 It “contains relics for the protection of Paris,” including a spine from the crown of thorns and relics of two Parisian saints, he said on Twitter. 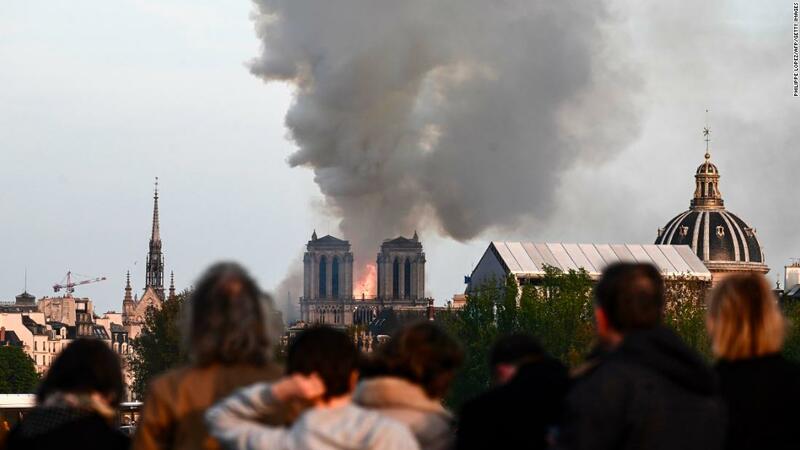 French newspaper Le Parisien, citing a source from the Ministry of Culture, said it was as yet unknown if the relics had survived the blaze. 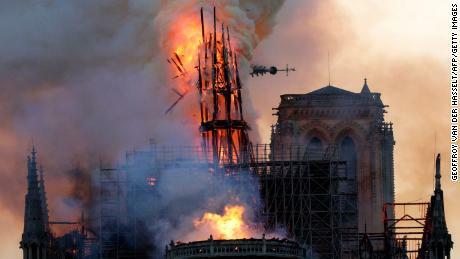 Paris terror attack hero helped save Notre Dame artifactsOn Wednesday, France’s Prime Minister Edouard Philippe said France would launch an international architecture competition to reconstruct the spire, saying that the contest “will be organised in due course.” A committee will be set up to oversee the project and will decide whether the spire should be reconstructed or “adapted to modernity,” he said.Philippe did not say if the cathedral would be finished in time for the 2024 Paris Olympics, but said the work would be done as fast as possible.Outpouring of supportThe show of emotion in the French capital and around the world has been heartfelt. 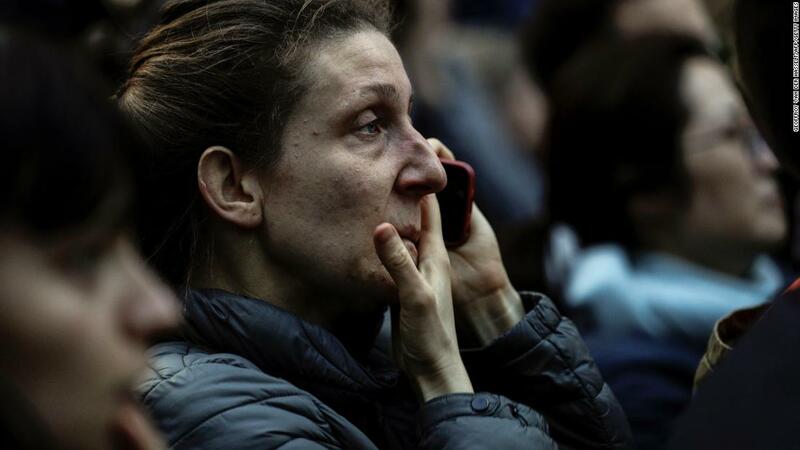 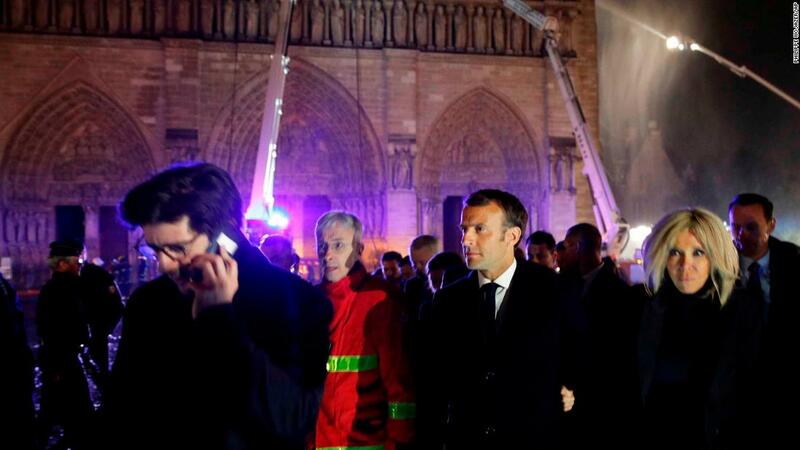 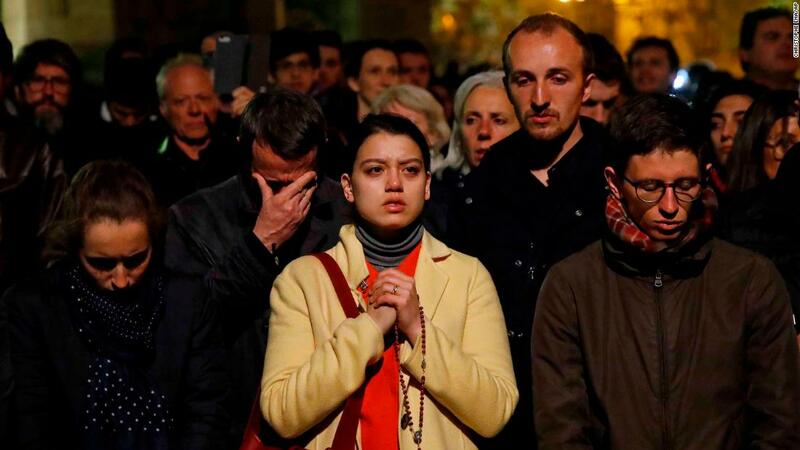 Hundreds attended a vigil Tuesday evening to grieve and sing hymns in tribute to the fire-ravaged cathedral, gathering in Paris’ Place Saint-Michel square, a stone’s throw from the devastated cathedral, after marching from the Church of Saint-Sulpice. 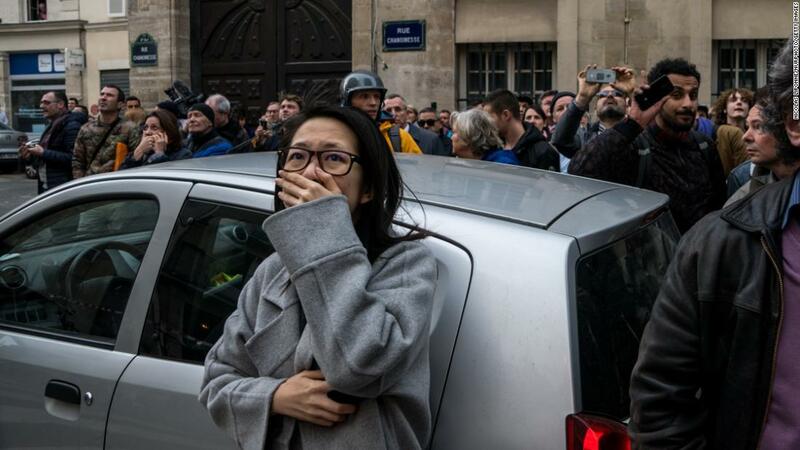 Most French political parties have suspended their European election campaigns, including French President Emmanuel Macron’s La Republique en Marche party. 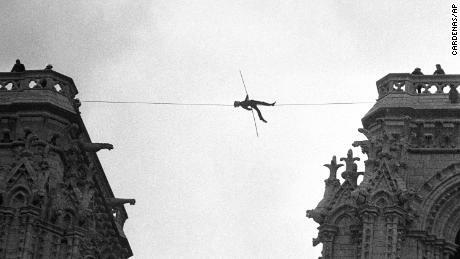 Coronations, protests and tightrope artists: A visual history of Notre DameMeanwhile, donations towards the restoration have been rising steadily; the total raised so far for the reconstruction of the Gothic masterpiece has topped 800 million euros ($904 million), including gifts of tens of millions of euros from some of France’s wealthiest families. 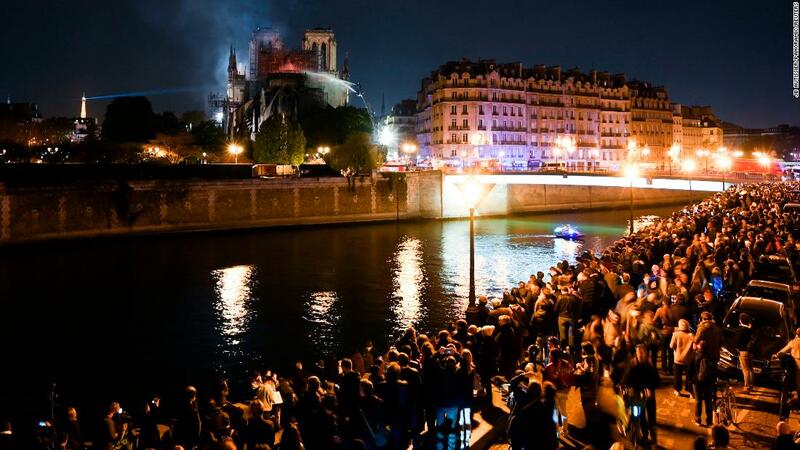 French billionaire Bernard Arnault, chairman and CEO of luxury good consortium LVMH, pledged $200 million, adding to a purse of $55 million promised by the city of Paris. 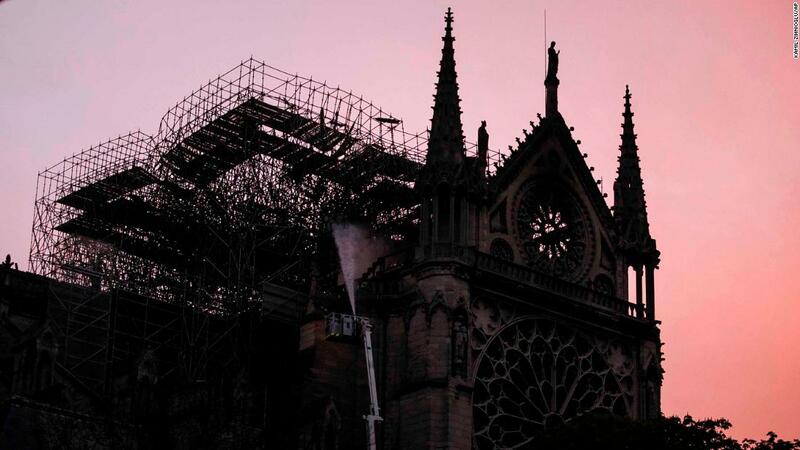 Cosmetics company L’Oréal, along with The Bettencourt Meyers family and the Bettencourt Schueller Foundation, has donated 200 million euros ($226 million) to help fund the repairs.Difficult, costly rebuildThe Vatican’s Cultural Minister has said the Vatican will offer technical know-how on rebuilding the cathedral, one of Paris’ most recognizable landmarks and a symbol of French identity. 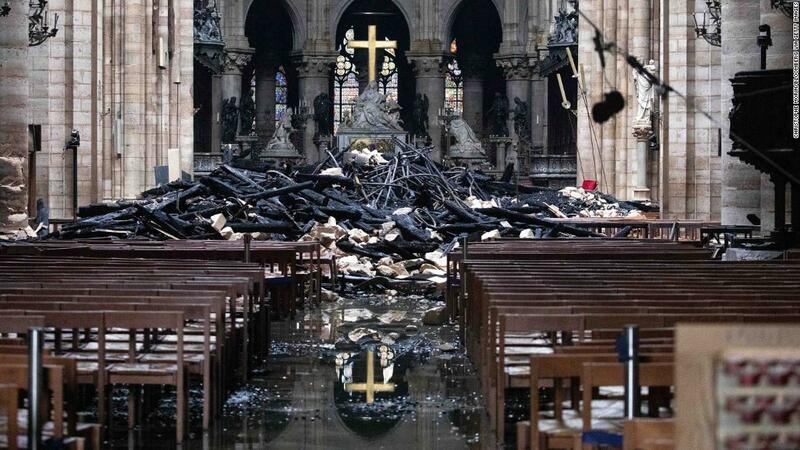 “We have the type of know-how that the whole world recognizes as being of high quality,” Cardinal Gianfranco Ravasi told reporters. 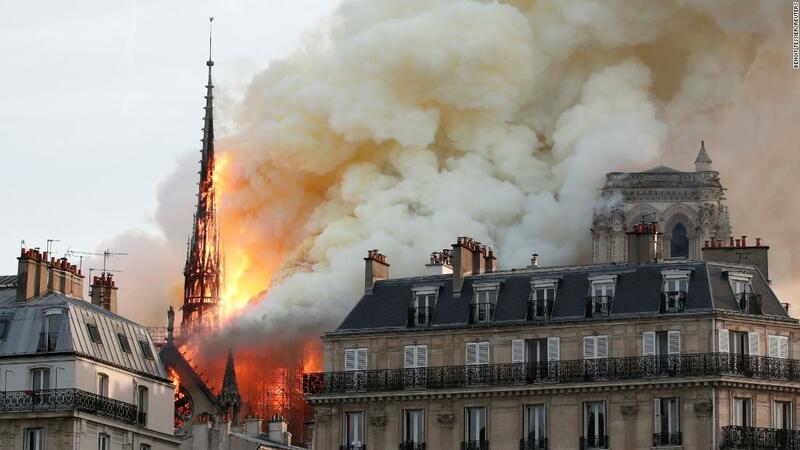 “So I think an eventual future offer by the Holy See will be significant.” Macron said on Tuesday “we will rebuild Notre Dame to be even more beautiful, and I want that to be done in the next five years,” but some experts say that time line is unrealistic. 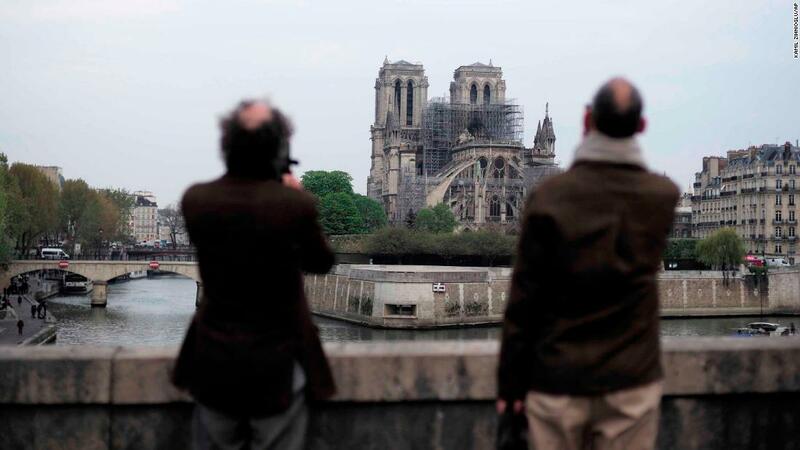 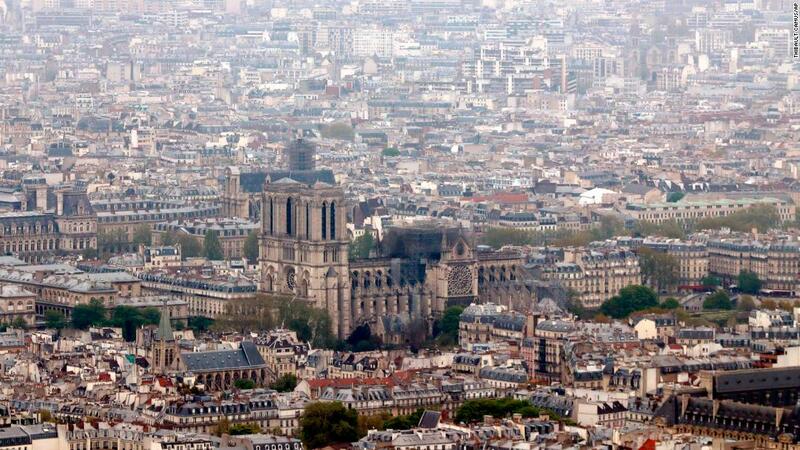 How to rebuild a Gothic masterpiece like Notre Dame, by people who have done it beforeThe full restoration of Notre Dame Cathedral will take “ten to fifteen years”, according to the head of the Group of Companies for the Restoration of Historic Monuments, Frédéric Létoffé. 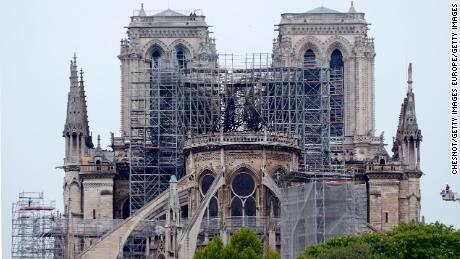 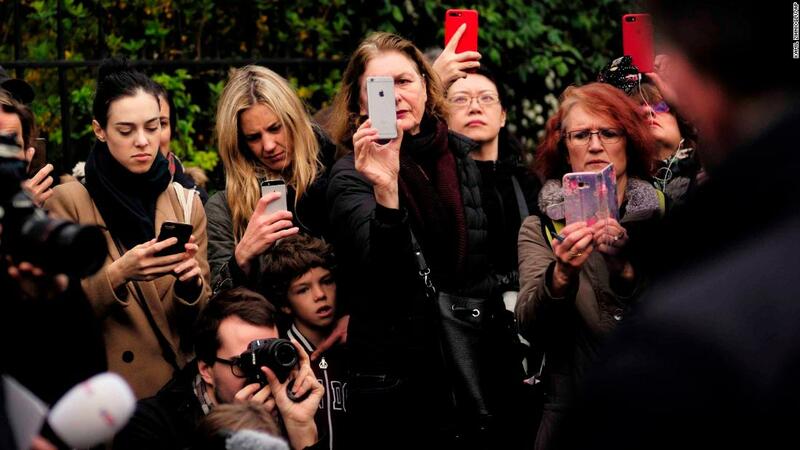 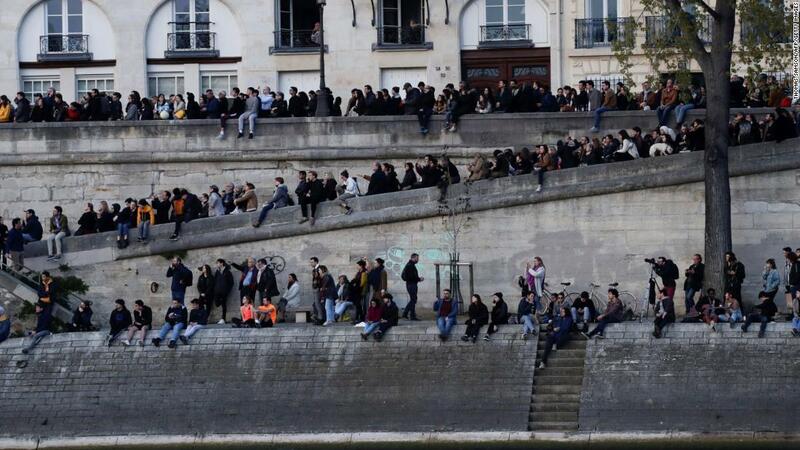 Speaking at a press conference in Paris on Tuesday, he said that the site would need to be secured before any restoration work can take place. 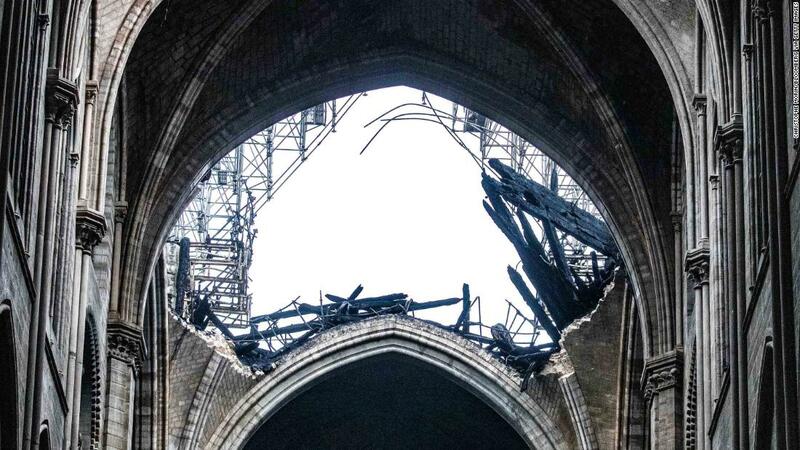 The reconstruction of the cathedral, whose foundation stone was laid in the 12th century, could be also be hindered by a lack of suitable materials. 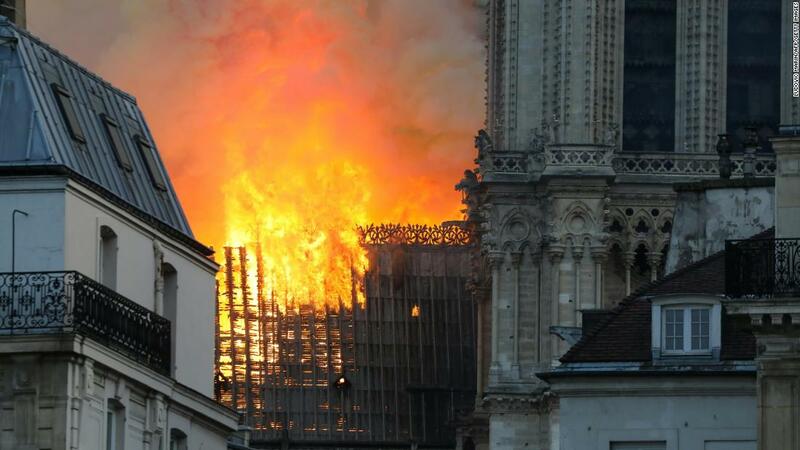 According to Bertrand de Feydeau, Vice-President of the French Heritage Foundation, there are no trees in France large enough to replace the ancient beechwood beams that burned in the fire. 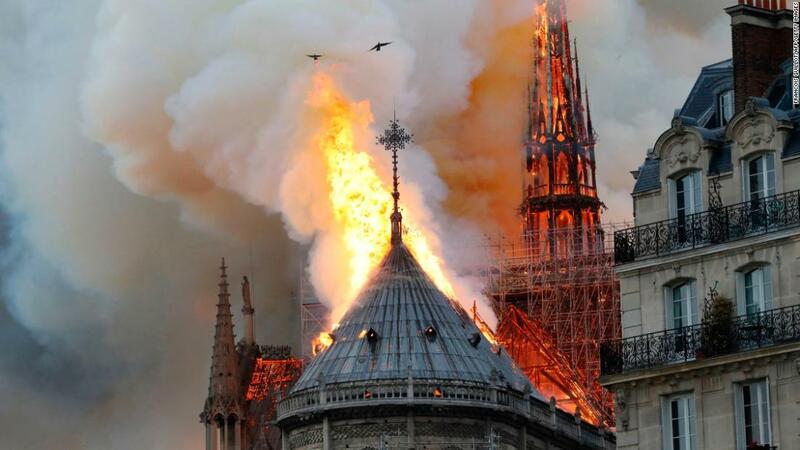 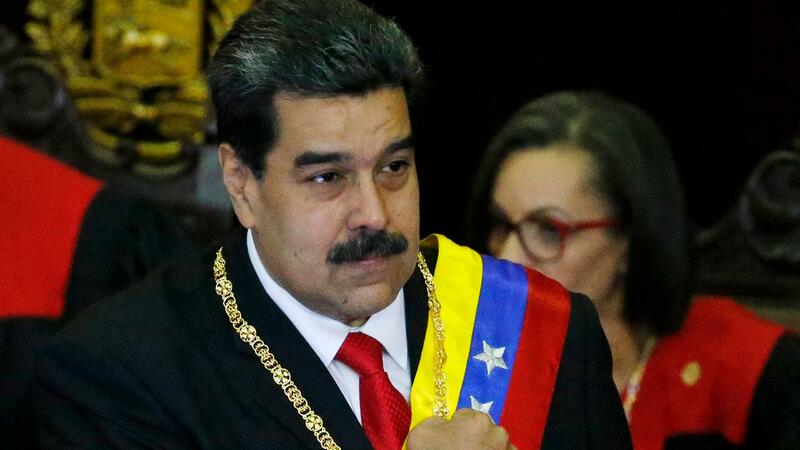 CNN’s Eliza Mackintosh, Katie Polgase and journalists Sam Bradpiece and Sandrine Amiel contributed to this report.